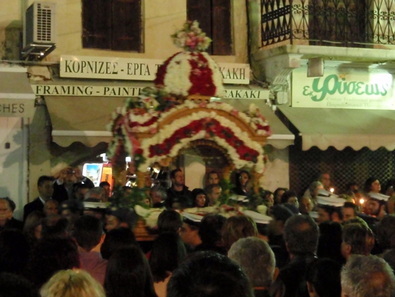 The epitaphio on Good Friday in Chania town. The great feast of Paska (Passover - Easter) has its roots in the far distant past. The Jews began to observe the Passover in remembrance of their delivery from Egypt and their crossing of the Red Sea. The early Christians continued to observe the Passover, even retaining the name ' Paska', but to commemorate Christ’s Resurrection - the passage, that is, from death to life. The Apostle Paul established the Christian symbolism of Paska for the first time. Early Christians began to celebrate Paska separately from the Jews, but they retained some of the features of the Jewish Passover, while at the same time adding others. This can be seen from the paskal lamb and the red eggs (the tradition of the symbolism of these eggs is a rich one). According to some authors, the Jews dyed eggs red as part of their celebration of the Passover. In Byzantine times it was the custom to bake ring-bread with a red egg in the middle. The egg is a symbol of life, while red is the colour of life. The dyeing of eggs for religious purposes is a practice, which is encountered in many parts of the world. Easter is preceded by a period of fasting of 50 days (Lent). The last week before Easter Sunday is Holy Week, the week of the Passion. The observance of the Easter customs begins on the morning of Palm Sunday. The faithful gather in church and are given a cross, made from palm fronds, which they put on their icon-stands at home and keep for the whole of the coming year. From Palm Sunday every evening throughout Holy Week the faithful gather in church to follow with devotion the story of the Passion of Christ. On Holy Tuesday, housewives make 'tsourekia’ - sweet breads, which are circular or oval in shape. The next day is devoted to washing and cleaning the house, while in the evening the blessing of Holy Oil takes place in church. Holy Thursday is the day when eggs are dyed. In the evening, after a reading of the 12 Gospel passages has ended, the girls decorate of the bier of Christ (epitaphio) with garlands of flowers. On the morning of Good Friday it is ready to receive the image of the body of Christ when this is taken down from the cross. Good Friday is a day of mourning. The drama of the death of Christ is followed with great devotion. Sweet things are not eaten - for the love of Christ, who was given vinegar to drink. Soup made of sesame-paste, lettuce with vinegar or lentils with vinegar are the food eaten on this day. No one should handle a hammer or nails - this is regarded as a great 'sin'. In the evening of Good Friday, Vespers is followed by the procession of the bier of Christ. A band or choir playing or singing solemn music precedes the procession. They are followed by the cantors, the clergy, women bearing myrrh, altar boys carrying the liturgical fans, scouts and guides, and the faithful, who themselves sing the hymns throughout the procession. All along its route, flowers and perfumes are scattered on the 'epitaphio' by the faithful, holding lighted candles in their hands. On Holy Saturday night, everyone is dressed up in their Easter outfits and overflowing the church entrances listening to the Liturgy of the Resurrection, at the stroke of midnight the light is pass out and then the faithful carefully take home their candles with the holy light of the Resurrection. Before entering their houses they make a cross with the smoke of the candle above the door, light the lamp before the domestic icons, which they keep burning throughout the year, to be re-lit only at the next feast of the Resurrection. It is a festive evening after the midnight mass; the younger generation usually goes out on the town whilst others return home for a feast of meat soup. Easter Sunday is another day of festivities, families roast lambs on spits, others in the oven. It is a day of song and dance throughout the country with lots of food and drink! 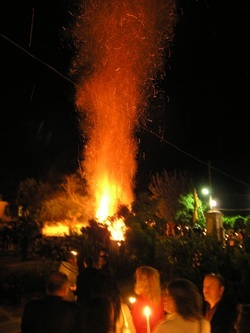 Throughout Greece, Easter and the whole of Holy Week are observed in a striking manner and in a religious spirit. This means that the banks will be closed from 2:30 pm on Thursday, the 25th of April until 8.00 am Tuesday the 30th of April. Most shops will be closed on Easter Saturday after 3:00pm, Easter Sunday and Easter Monday. Throughout the week shops will be open 9:00am - 2:00pm and in the evening from 6:00pm - 9:00pm. Tourist shop hours will remain open in any case. Some tavernas close on the Good Friday, some on Saturday & some on Sunday. So really it is a "see what is open" - or ask in the taverna what they are planning on doing over Easter holiday. There isn't a rule that everyone follows, so it is difficult to know what is open or not. Most supermarkets will keep the same hours. The supermarkets will be open on Wednesday and Thursday from 8:00am - 9:00pm. On Good Friday it will open 9:00am - 8:00pm, and on Easter Saturday from 8:00am - 6:00pm and closed on Sunday & Monday. But you will find that most mini markets are still open during the holiday period from morning until late at night. Church services – There are mock funeral processions (epitaphio) in most towns and villages on Good Friday in the early evening. After the main church services on Easter Saturday Easter candles are lit and, occasionally fireworks from midnight on Saturday & the burning of the mock Judas. Most tavernas are closed on the Saturday evening. Everyone is dressed up in their best clothes on the Saturday evening and they go to church for the strike of midnight and everyone lights their candles with the holy light & they usually carefully take it home & bless their house by using the flame and making a cross on the entrance of the door. We recommend that you try the Easter cookies and sweet bread ‘tsoureki’ (usually baked with a red dyed egg in the centre). Happy Easter! If you want to see any of the events, just ask a local in your nearest village for start times, as sometimes the smaller villages have to ‘share’ priests & the times may be different at each church. 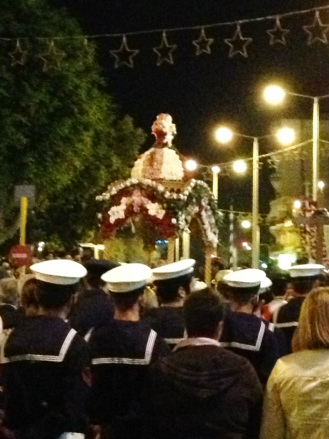 The large church Trimartiri, on Halidon Str, near the Chania harbor does all the processions & is a big event – which you can then finish your evening with a coffee or drink on the harbor front.